One of the first great sorrows to fill the heart of our Blessed Mother came at the moment of Jesus’ birth. It’s hard to fathom that at the moment the Mother of God was about to give birth to her Son, the Savior of the World, the only place they were welcomed was a place where animals dwelt. There was no room for Him in the inn or in any other home. It must have been quite an experience for her. She was aware of the amazing fact that her Son was the promised Messiah. She knew that she had conceived Him miraculously, by the overshadowing of the Holy Spirit. 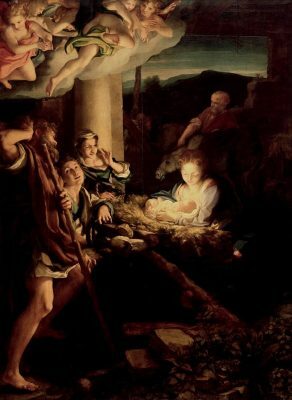 But now that it was time to be born, He was rejected for the first time. His first bed was a manger, the feeding trough for animals. Rejection was a part of the lives of Mary and Jesus. It began with His birth and ended on the Cross. Our Blessed Mother was there throughout. But the rejection they encountered in life never robbed them of their peace and joy. One thing that clearly overshadowed the rejection of the world was the shared love of this mother and Son. The bond that they shared served as their mutual daily spiritual food. Their shared love enabled them to overcome the pain of earthly rejection so as to live the will of the Father to perfection. So often in life we also experience rejection, misunderstanding and a lack of welcome by the world. When this happens, there is a great temptation to get angry and even despair. The key to enduring rejection is to be certain of the love and full embrace of the Mother of God and Jesus her Son in your life. They are always there with arms open wide. They will never leave you. They will never reject you. This gift of their loving embrace must also be offered by you to others. You are called to be the Mother of Jesus and you are called to be Jesus Himself to others. Your care and concern for others must be motivated by the love you receive from this Holy Family. Reflect, today, upon two things. First, know that you are always welcomed by the Mother of God and by Jesus her Son. You always belong to this family. Reflect, also, upon your duty to bring their family love to others. This is especially the case for those in need and those whom God has entrusted to your care. Do not waver in being welcoming in every way, for in the act of welcoming another, you will find that you are welcoming Christ Himself. Dearest Mother, I thank you for welcoming me always as your child. May your heart be my home as I rest close to your Son. May I never be deterred by the rejection I encounter in this life. Instead, may I always turn to your loving embrace, knowing that you welcome me as you welcomed your Son into this world. Help me, dear Mother, to always provide care to those who encounter rejection in this world. May I be an instrument of your welcoming heart to all who are in need. Precious Lord, You had no place to lay Your head except a manger. Yet the presence of Your mother was all the welcome You needed. Help me to open my own arms to You as You show Yourself in others. Help me to seek out those rejected and in need. May I be that manger for them and a refuge of Your own divine love.